What a stretch of weather we just had down here in Key West. Mostly sunny skies, warm, light southerly breezes and temperatures around 80 degrees. Now that's why I move to Key West. The calm warm weather started early last week and lasted up to yesterday morning when another cold front pushed through the Keys. Water temperatures increased ten to fifteen degrees to the mid 70's in the afternoons during the outgoing tides. Absolutely ideal conditions. Not only great weather and warming water, a new moon and good tides. The perfect concoction of elements for banner flats fishing and it showed. Though we had great fishing during this stretch with many great catches and fun days on the water the following three days took top honors. 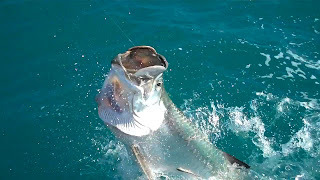 Last Friday February 4th, we caught the first slam on my boat of the 2011 Key West fishing season. I fished with Steve and Jim. We started at first light for some early season Key West tarpon. Just as the sun started to lighten the dark sky tarpon began rolling every where. Steve hooked up on a plug soon after the tarpon showed up and landed a big 80 -90 pound tarpon. Jim was up next and we drifted the same area where Steve hooked his fish. It didn't take long and Jim got bit. JIm's tarpon took to the air and the plug came flying back toward the boat. A few more casts and Jim had another hit and a miss followed by a massive boil from another large tarpon that missed the lure. Great start to a beautiful day. We ran west of Key West to find permit during the incoming tide. When the tide rolled in so did the permit and tails started popping up on the shallow flat. We had some great opportunities at permit but with a clear sky and almost flat water the fish were a bit spooky. Jim was able to find a willing permit after several shots and landed a nice 10 pound permit. Two thirds of the slam down. It was getting late so I hit a couple of bonefish spots on the way back in. At the last spot of the day it finally happened and Jim landed a quality five pound bonefish to complete the Key West Slam. Sunday February 6th I was fishing with the Steve and his father Merritt. It was our third day and we caught a lot of fish. I was heading to the last spot for the morning when I saw a tail pop up in front of the boat. I quickly rigged a crab and handed the rod to Steve. He made a perfect cast in between the two feeding permit. One of the permit picked up the crab and raced across the shallow flat. As I was pushing after the fish I looked behind me and saw another permit working toward us. I jumped down grabbed my bonefish rod rigged with a flats jig and made a cast. Hopped the jig a couple of times and the permit followed. Let it sit, another little hop and he ate it!! I tapped Merritt ,who was sitting on the cooler, on the shoulder and handed him the rod. He had now idea what just happened and was surprised to be handed a rod with a nearly twenty pound permit screaming line off the reel. A good twenty five minutes later and obstacles and cross overs avoided both permit made it in the boat for a photo. Finally, Thursday afternoon February 10th I fished with good friend Wild Bill Heindle. We were chasing tailing permit with a fly rod taking advantage of the afternoon outgoing tide. We saw a few permit and were able to spook them really good, not getting any quality shots. We did find one school of bonefish, which I initially thought were permit looking at them in the glare. Bill placed a cast near the school, made a couple of strips and one of the fish ate his fly and tore across the flat with it. 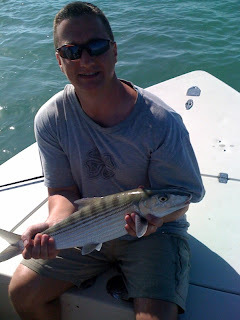 I was stunned when I got the bonefish in my hands to see a big 8 - 9 pound bonefish. This bonefish was about 26 inches long (rough measurement) and very thick across it's shoulders. Warm calm weather during the winter months plus good tides equals great Key West fishing on the flats.